I purchased this car in July 1974 with 21,000 miles on the odometer. It was Pale Primrose. It was repainted and given a new interior in 1987. Now, 34 years later, the car has 108,000 miles on the odometer and is still in my garage. It’s driven regularly. We would like to thank Chuck Methven, Jeff Wergeles and all of the other contributors to this issue of the Octagon. Also thanks to Art Isaacs for his continued work in answering members’ technical questions and answers. Be sure to send in photos and stories so we can include them in future issues of the Octagon. Also by the time you receive this issue we should have received our shipment of member grille badges and key fobs. This is in response to many member requests. Check with the club for availability before placing an order. The club now has a Message Board at http://board.amgba.com , a blog located at http://blog.amgba.com . 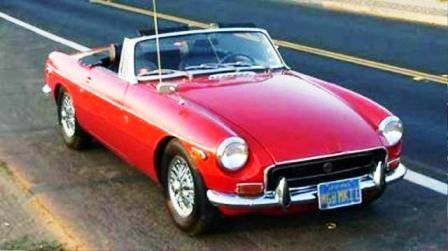 The sites are available to all but American MGB Association members are able to place ads and access more technical information. The new American MGB Association Photo Gallery is located at http://photos.amgba.com . The same login is used for the Gallery as the Message Board. Members can downloads their car photos directly at this location. Also now you can to create your own id and password for the members only section. Submit the form on the members only page to do this. Have a great end of the driving season and have a great holiday season!